Considered one of the best-selling infused cigars in the industry, ACID hand-rolled premium cigars have come out with another high quality winner with their G-Fresh cigar line. Each of these cigars are created with140 top-secret botanical herbs and spices, aged Nicaraguan long filler tobaccos and hand rolled perfectly in Sumatra or US Connecticut wrappers. Every ACID G-Fresh premium cigar provides a smooth, flavorful aromatic smoke that shows why the ACID brand is the smokes of choice by those seeking total relaxation from the daily rigors of life. 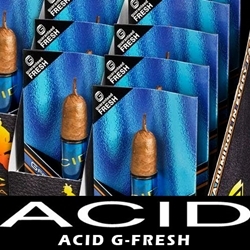 ACID G-Fresh premium cigars are packaged nice and snug inside individual sealed fresh packs with a humidifying device so they stay fresh during shipping and at home without the need for a humidor.